Beaded thermocouple assemblies with ceramic sheath. Good temperature management is essential in the glass and ceramics industry to ensure that the manufacturing process remains reliable and control costs. An ideal combination to guarantee the quality of your production while helping to cut maintenance costs and energy spending. Flat glass, hollow ware, glass fibre and glass wool, heat treatments, ceramics: Pyrocontrole's offering is ideal for all sectors of the glass / ceramics industry. Whether you require standard or specific products, our team of experts is there to listen to your needs. Pyrocontrole has developed a complete range of sensors for the glass industry. >Applications: melting furnaces, chambers, working tanks, feeders, siphons, basins, floats, lehrs and heat treatments. for monitoring the temperature and guaranteeing safety of the process. These measuring tools are necessary for melting furnaces, chambers and working tanks. for checking and measuring the temperatures in the floats, lehrs and heat treatments. 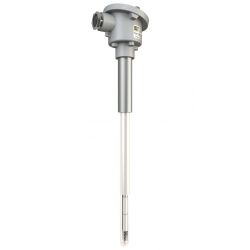 Essential for mapping the flow of the glass stream, used in feeders, siphons and basins. The control requirements for glassmaking are essential to adjust the temperature as closely as possible. Equipped with advanced technology, the Thyritop power controllers provide the best response to the needs of glassmakers. - multiple control and supervision possibilities. These communicating power controllers control all the resistive and inductive loads for the electrical heating system. Available in 3 versions, from 37 A to 2,900 A, it offers accuracy, flexibility and a rugged design for control of the heating elements. The Thyritop 30 models meet the most widespread requirements for electrical power control. Simple to use and particularly rugged, this is the lowest-cost power control solution.